Baking fresh ravioli opens up a whole new world of "pasta-bilities" you don't get with dry pasta. Fresh ravioli has a chewy bite and more flavor, even though it doesn't cook to al dente. 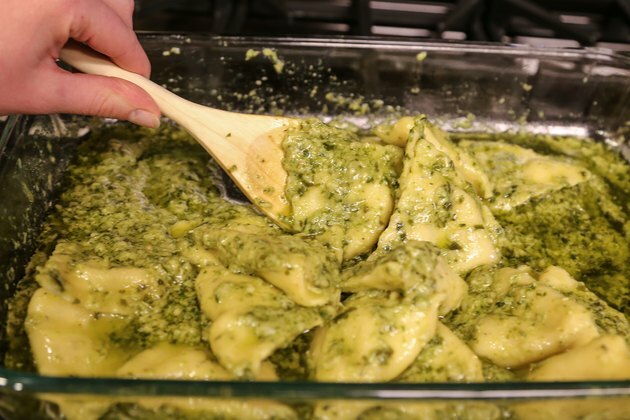 When baked, fresh ravioli develops a pleasant chewiness that bursts with flavor from the sauce it absorbs and from the sugars that caramelize on its surface -- something you don't get with boiling. 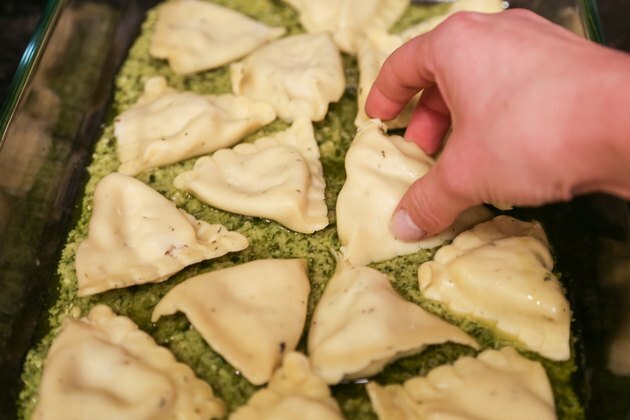 Whether you use homemade ravioli or buy it fresh, baking adds complexity to its flavor, aroma and color. 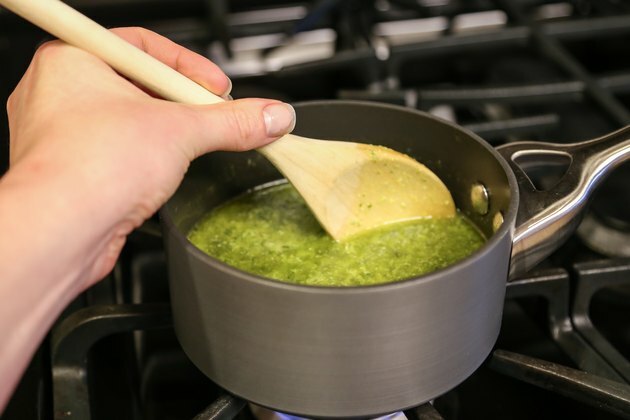 Heat up a storebought sauce in a saucepan until warm, or make your own from scratch. 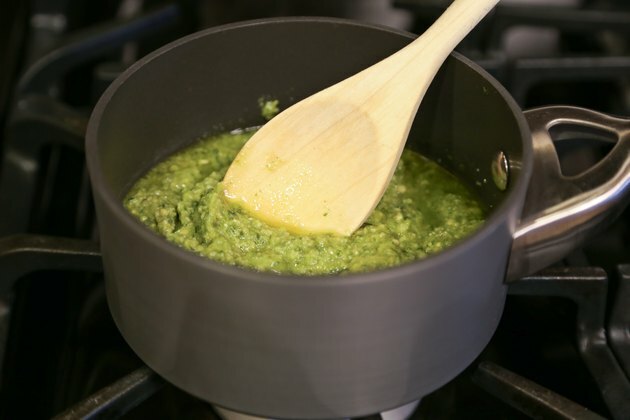 Choose light cream- or butter-based sauces, such as garlic butter and sage, or oil-based sauces, such as pesto. Mix the sauce with water or stock, using a 4:1 ratio. For example, mix 1/4 cup of liquid with every 1 cup of sauce. The ravioli will absorb the extra liquid, and the sauce will reduce and return to normal thickness. 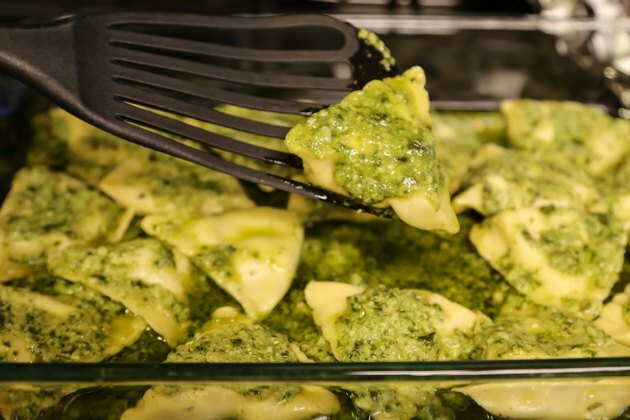 Mix water with even butter- and oil-based sauces; the ravioli will absorb the water and any remaining will evaporate. Spread a 1/4- to 1/3-inch layer of sauce in the bottom of a wide, shallow dish or gratin dish using a spoon. Place the ravioli on top of the sauce, spacing them about 1/4 inch apart. 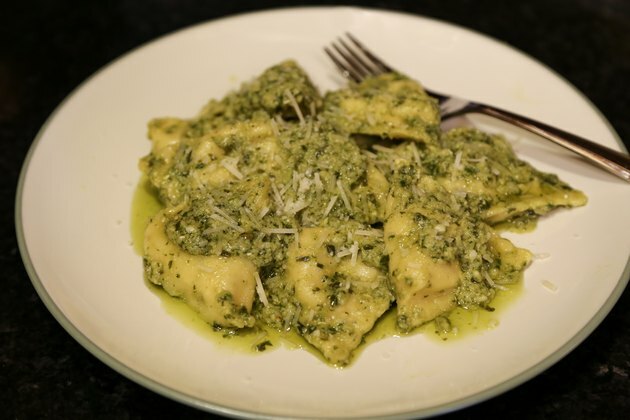 Sauce the ravioli sparingly, so as not to mask its flavor, and add more sauce to taste when serving, if desired. Spread a 1/4- to 1/3-inch layer of the sauce on top of the ravioli with the back of a spoon. Cover every part of the ravioli so no dough is exposed. Cover the dish tightly with aluminum foil. 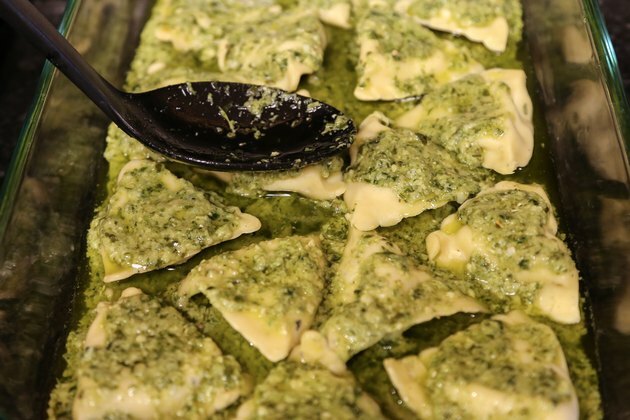 Bake fresh ravioli for about five minutes, then remove the foil. 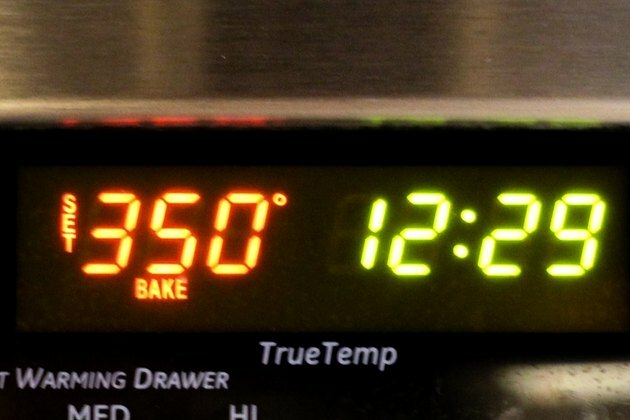 Turn the ravioli over in the sauce and bake another three to five minutes. Add more sauce to cover the ravioli, if necessary. Bake frozen ravioli for 10 minutes, remove the foil and bake for another five minutes. 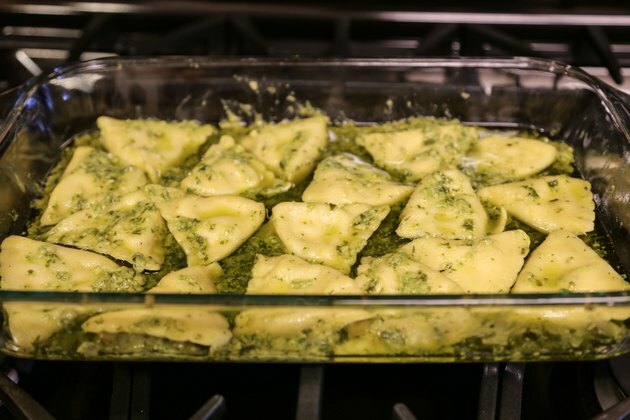 Take the ravioli out of the oven and let it sit for about several minutes to firm up. Stir the ravioli and serve it as-is or add more sauce to taste. Garnish with fresh herbs, grated cheese or gremolata, a mix of fresh parsley, lemon zest and minced garlic.